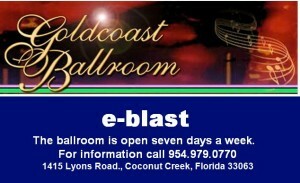 Goldcoast Ballroom publishes a free E-mail newsletter, the Goldcoast Ballroom e-blast! The Goldcoast Ballroom e-blast is written, edited and published by John Rannella, one of our Champion Senior Amateur dancers. It comes out every two to four weeks – or whenever there is Breaking News. On this website, we also publish a Coming Events page, where we post immediate announcements of new coming events, and also periodically publish updates on other dance news. 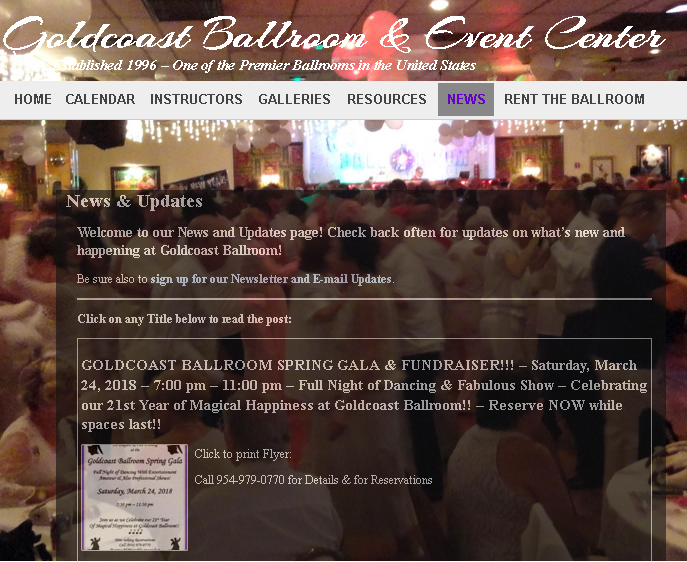 Our featured announcements of What’s New and Happening at Goldcoast Ballroom are also posted in our Dynamic Gallery on the Home page of this site.